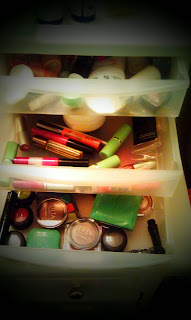 I've always had a fascination with makeup and all things beauty. I remember as a kid, sitting at my grandmother's big, white, vanity and playing with her many silver tubes of Clinique lipstick and admiring her Pond's cold cream. And I shudder at the thought, when my grandfather caught me, around 12, wearing bright red Wet n Wild lipstick ( I won't tell you what he called me...use your imagination). My first kiss occurred only after applying one of my many (this is an understatement, I swear I had every flavor they made) Lipsmacker lip balms. And I can still smell my mom's Fashion Fair Brown Sugar lipstick. 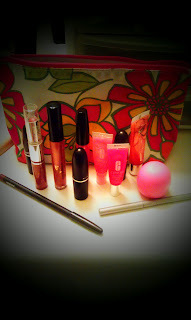 While my beauty love started with lipstick and lip balm, I believe my love affair with lipgloss started with Oh! Baby by MAC. And it has continued to this day. I am always looking to try new or resurrect old shades and formulas. One could say I'm kind of obsessed with my gloss. 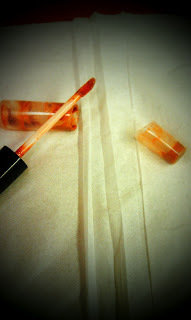 Recently, fed up with never being able to get the last drop out of the tube, I did a little surgery. Maybe a little extreme for some, but not for the lipgloss junkie. What are your lip loves? The Avon surgery patient. lol. I got every drop. As parents, do we inadvertently teach our kids to recognize the differences among individuals all while preaching that God created us as equals? The other day while reading Ramona and her Mother by Beverly Cleary to my eight year-old, she commented "Stop reading it like a black person, they're white." At the time all I could do was hand her the book back and shake my head (mommy faux pas # 1: missed the teachable moment). After seeing the reactions of folks on Facebook (mommy faux pas #2), mostly in applause, and speaking with my husband, it made me reflect back on how I'm rearing my children. A few years back, my daughter was constantly saying how she wished she had blond hair and blue eyes. I partially attributed this to the lack of images of young (6-10yrs) black children in mainstream kids media (ie. Nickelodeon, Disney Channel). And while it is getting better, the images we still still hardly ever look like her. So at the time, wanting my child to understand how beautiful she is and that beauty comes in many shades, I subscribed to Essence to show her what she didn't see on tv. I wasn't trying to purposely cause a racial divide, but to merely boost her confidence and instill some pride. Now I wonder, did I do the wrong thing? If you look at my family, where we come in such a vast range of skin tones and hair textures, how can you not see the beauty in God's diversity. I'm thankful that my children aren't growing up in the segregated south of years ago, though if we turn on the news, Trayvon Martin's death tells us we aren't but so far removed from it. I suppose the best thing I can do for my daughter and son is to expose them to images of varying backgrounds (Dora, The Cosby Show, Hannah Montana), seize the teachable moments, and teach them that none is better than the other. We'll continue to read Essence and American Girl books and listen to Beyonce and Adele. And as my motherly duty, I'll always tell them how beautiful/handsome and smart they are. We are truly all part of God's beautiful rainbow of children and should be acknowledged as such. You can't make progress if you don't start somewhere. I said that it was time to make a change. Time to clear some of the clutter that has been dragging me down. Well, as much as I could tell you about it, I thought it made even more sense to show you. These are the before and after pictures of my dreaded kitchen shelf. 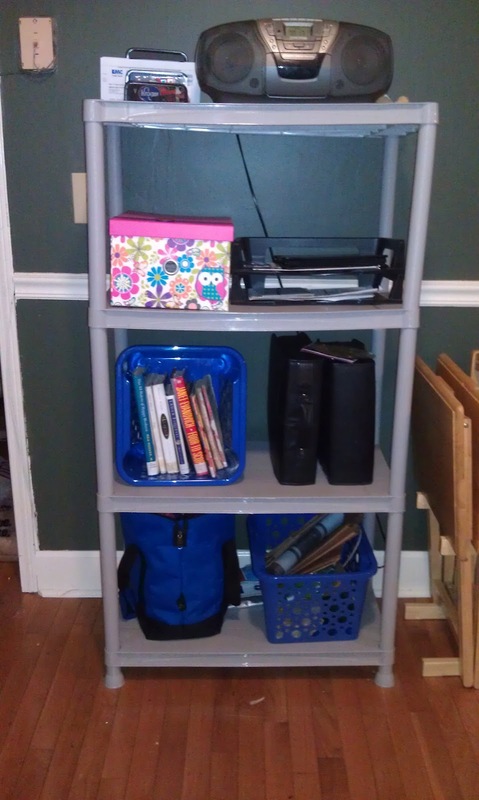 It was so exhilarating to finally organize it. And mostly to purge the unnecessary items taking space and draining the energy out of my house. This took up most of my Saturday. But for hard work there is a reward. My in-laws unexpectedly picked up the kids, which allowed me and hubby for some overdue alone time. We finally got to knock some of those movies off of the DVR. And as great as my Saturday turned out, I had an even better Sunday. I was spiritually fed by the wonderful Rachael Miller of Color Me Organized and the lovely ladies of Women Empowering Women. I am now better armed to pursue my purpose with a passion and I am beginning with cleaning my house, literally. No need to be ashamed when unexpected company comes, let;s be prepared. With all the chaos of everyday life, one could ask how? Well, I'll be honest...I'm still figuring it out. I'm a mom. I'm tired. And honestly, not that well motivated to clean (I'm transparent too). But, I am also a believer and a dreamer. And frankly, I am better. And everyday I aim to make little steps with a lot of support. You can do it too! I am living the life. I am sitting in a hotel room, paid for by work, and flipping through the channels on the television. Nothing more, nothing less. Ten years ago, living the life would include hanging with my girls in some far away city. Yet, here I am in good old Columbus, GA and this is now my definition of great. It's so amazing how when you're younger the world is your oyster, but when you get a little older you realize that oysters are kind of slimy. Well, I guess it's just a change of perspective. While I would love to be strolling the Seine, I am well aware that that path I chose includes more of safaris with Diego. I love my children with every part of my being. There's nothing like the smile on my son's face when I pick him up from school. Or having girl talk with my daughter. But there's also nothing like having a few moments alone. Time to process my thoughts without any demands. Time to remember that I was a person before a mother or a wife. So while it may seem a little selfish to enjoy business travel for the sake of personal gain, I wouldn't change a thing. If I didn't have a moment to step away from my ever so crazy life, I wouldn't be able to see the beauty in it. So I'll enjoy my peaceful hotel room to renew Nicole so that Mommy can return home tomorrow. After all, it's the little things. Fellow Mommies: Take care of yourselves and you'll be better able to take care of others. Sometimes that means getting a night away and sometimes it means making a pit stop at Ulta. I'll take both. My house is a disaster. There, I’ve said it. As I was reading this month’s Good Housekeeping about clearing clutter, I glance around my kitchen and it was like the author was pointing a finger right at me. It’s not as if this is a brand new revelation. Of course it’s something I’ve always known, something that I’ve even spouted to some of my friends at times. But for some reason, this one article made me take a look around. A good look around. Let’s face it, I was a messy child. I find sentiment in almost everything or assumed value (“I could use this for…”). My mother was always trying to get me to clean my room and then threw things away behind my back. And sadly, this is the same thing I’ve done for my daughter. Blaming her for not keeping her room clean, but not giving her a good example to follow (Note: My mother actually kept a clean house, not sure what happened to me). She even questioned me once, “Why should I clean my room when yours is a mess?”. And I believe I gave a song and dance about “do as I say and not as I do”. In my profession, I know that doesn’t work, but it didn’t stop me from trying to cover up my own personal flaws. 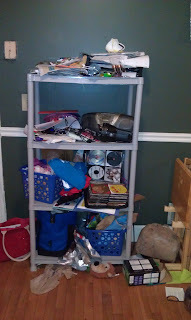 So as I sit here looking around, I see the shelf that was purchased to keep junk off of the kitchen table. The shelf that is covered in mail that hasn’t been opened and a ridiculous collection of reusable grocery bags. Those bags are sitting next to a crate of plastic grocery bags, because I never quite remember to take the reusable ones to the store. Then there’s the pile of cardboard boxes meant for recycling, however I probably only make it to the recycling bin once per month. You can imagine how that pile can grow. My attempts at being good for the earth are making a muck in my house. And then there is the collection of Easter candy on top of the refrigerator. Whose idea was it to collect candy for holidays? Seriously, Halloween, Valentine’s Day, Easter, and sometimes Christmas always produce 2 piles of candy in my home, which I never let the kids eat. And since the economy is tight, the candy is usually the cheap kind that I don’t even want to eat. And so it sits. I’ve made valiant attempts to try to free myself from the clutter. I donate clothes to Goodwill or whichever organization is willing to pick it up at least once a quarter. It’s a great tax deduction and the kids outgrow their clothes so quickly. Sadly the last time I had a scheduled pickup, they left some of the stuff on the porch…and it’s still sitting there. I know, trifling. Well something has got to give. In recent years, I think I’ve excused away some of my clutter by knowing that I’m not completely alone. From visiting other people’s homes for work, I can say that almost all of the homes I’ve been to over the years have been corrupted by clutter. The few that weren’t the moms admitted to either having a maid or cleaning for our visit. And those that were immaculate, only a few, I kind of got scared that the kids weren’t getting a proper developmental experience. Go figure. I’ve been to the homes of well to do folks and homes in the projects where roaches weren’t given a second thought. The one thing these homes had in common was the kids that lived there. I went from having a cluttered apartment with only my stuff to a house with 4 people’s belongings. I don’t have an active system for eliminating clutter, just an effort to continuously buy a shelf or a basket or new hangers to move around the clutter. So instead of doing the same thing and buying more fancy hangers, I’m going to do as the article says and determine if we “love it or use it” and make a plan to purge. They say “Cleanliness is next to Godliness” and right now I would probably ask for a rain check if God showed up at my door. Let’s see how much I can get accomplished in the next 3 months. Everything in my house needs to stand before the jury to determined if it is worthy of being saved or purged. Everything, except my lipgloss.